Ariarne Titmus announced herself as a genuine chacne in Tokyo in 2020. 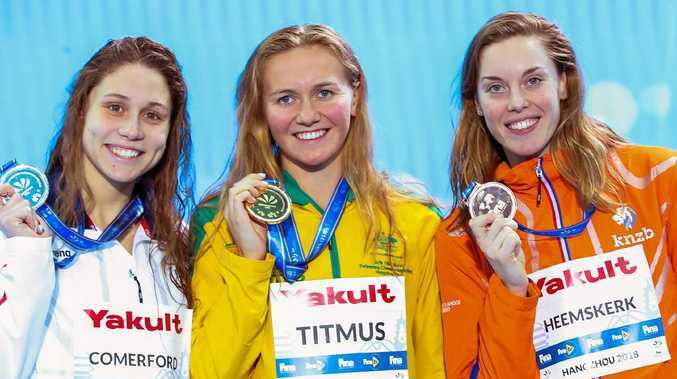 TEENAGER Ariarne Titmus has secured Australia's first gold medal of the world short-course swimming titles in China with a record-breaking 200m freestyle win. The 18-year-old mowed down American Mallory Comerford and the Netherlands' Femke Heemskerk in the last 50m to claim victory in 1min 51.38sec - a new Commonwealth, Oceania and national record. Titmus' stirring effort on the opening night of the six-day event at Hangzhou shattered Emma McKeon's mark of 1:51.66 set at the 2015 national short course titles. It moved the teenager to fourth on the all-time rankings. "I have been working on my speed, so I am glad it paid off. I knew the back end was my strength, so I just tried to play to that and it worked," Titmus said. "It is my first individual world title, so it is a good stepping stone to next year with world championships and then Olympics after that." Ariarne Titmus celebrates her big success in China. Australia missed out on a second medal by just 0.05 of a second in the men's 200m individual medley final. Champion backstroker Mitch Larkin was touched out for bronze by Japan's Hiromasa Fujimori while China's Wang Shun took gold. Larkin earlier scraped into the men's 100m backstroke final as eighth fastest behind top qualifier and world record holder Xu Jiayu of China. Australia's team of Cameron McEvoy, Louis Townsend, Jack Gerrard and Alex Graham finished fifth in the men's 4x100m freestyle relay with a Caeleb Dressel-inspired United States claiming gold in a new world record (3:03.03). Emily Seebohm is chasing gold in China. Rookie Nic Brown locked a personal best 1:52.10 to finish seventh in the men's 200m butterfly final behind Japan's Daiya Seto who claimed gold in a new world mark of 1:48.24. Veteran Emily Seebohm was fifth fastest for Wednesday's women's 100m backstroke final with teammate Minna Atherton sixth quickest behind top qualifier, Olivia Smoliga of the US. 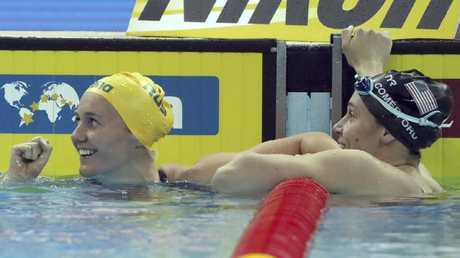 Seebohm (14th) missed a place in the 50m breaststroke final but Jessica Hansen nabbed the last spot in the field by winning a swim-off with Japan's Miho Teramura after they tied for eighth fastest in the semis.